A multi-level outdoor kitchen area with custom pergolas covering the dining bar and seating area. All designed and built by the Outdoor Artisan team. Outdoor Artisan is . . .
A family owned, Charlotte local company, passionate about designing and buildingexceptional outdoor living spaces. Founded by Clive Newey in 2012, and continuing to grow. Our mission is to deliver excellence in design and craftsmanship, while giving our clients a five-star service experience. We believe our efforts toward this is why we have earned the Best of Houzz Award in Service, every year from 2015 - 2018, and the Angie’s List Super Service Awards from 2013 - 2017. We work hard to be a team you can trust, with both your investment and your yard! Please don’t just take our word for it, read our reviews on Houzz.com and be sure to check out our project gallery. Consultation: One of our designers will meet with you at your home and take time to ask questions, listen and brainstorm with you to find the right layout and material options for your style, property, and budget. Often they will sketch a concept design while there, as well as discuss ideal materials. This is a very informative meeting, with a focus on establishing a clear vision for your yard. Design: Invaluable. We'll use our award winning design experience to give you an attractive custom solution for your property. Take a look at our project gallery on Houzz.com to see examples of what our designs become when they grow-up. Materials: Meticulous. We work with natural stone, brick, pavers, block, concrete, manufactured stone, and large boulders for our hardscapes, and use cedar, rough sawn pine, ipe or pressure treated lumber for our pergola and cabana structures. Our team also provides and installs landscaping materials and outdoor lighting to complete and compliment your space. Price: Fair. We are a craftsman company, not a production company, so we won't be the cheapest. That said we offer great value for our services and work hard to design spaces to suit realistic budgets. Our quote is the price, not an estimate, so no cost surprises! Projects: Consistently, beautifully executed, at or exceeding standard installation practices, whether it's a simple path or a complete outdoor living space. Our projects are installed to stand the test of time and all our work is warranted. Customers: Happy! We deliver what we promise and then some. Please go to angieslist.com to read confirmed customer reviews about our team. You need to join, but it's now free and is one of the best sites to help you find reputable contractors. For some more about us and some good tips for planning your hardscape, check out our blog page. Clive and Tracie, checking out a carved boulder fire pit, that was designed and installed by the Outdoor Artisan team. Owner Clive Newey, posing on his first day of school in Clydebank, Scotland. 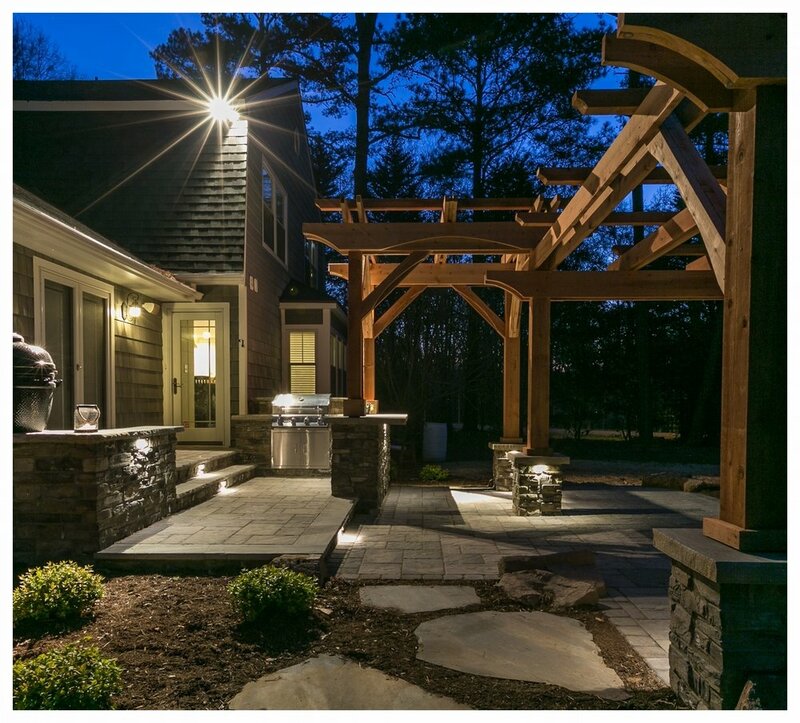 Clive Newey, owner of Outdoor Artisan, has been designing and installing outdoor living spaces in the Charlotte area for 14 years. He excels in visualizing the potential of a yard and creating designs that bring together beauty and function, to best suit the style and property of his clients. Clive puts emphasis on the "feel" of the space and its continuity with existing surroundings. As demand for our services continues to increase, Clive has recruited exceptional project managers, masons, carpenters, skilled labor and contractors with similar vision and standards. Even so, a good portion of his time goes to overseeing projects "in action" to ensure all materials are correctly and consistently installed to capture that "feel" with careful attention given to details. Originally from Scotland, Clive attended school in Canada where he met his wife Tracie, a true treasure! She handles the business administration and customer communication. They have two, indescribably precious daughters and one "Dusty" dog that thinks he is the son! They are happiest when outside on a beautiful day with their friends and family. This is a big part of why they do what they do; creating exceptional spaces that bring people and the outdoors together.